The more we use Internet in education, the more important source criticism becomes. I´d like to start with a few examples that shows that you´re not ”safe” anywhere anymore. 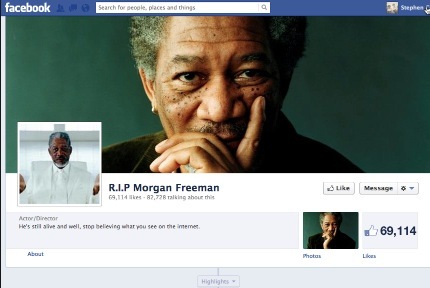 During 2012 a rumor started on Facebook saying that the actor Morgan Freeman had died. Lots of people shared the rumor without questioning if it was true or not. It turned out to be false. Another example is when formula 1 driver Michael Schumacher got injured when skiing. Within a few days there were at least 177 RIP-pages on Facebook, that alla stated that Michael had died (which wasn´t true). If you wonder why they do that? The answer is to make money. Every click can generate money from advertisement and many clicks can make more money. That they have to lie to generate more traffic is a side effect to reach the goal (to make money). Drogfritt.nu is a swedish page that says it´s an independent nonprofit organisation with no religious connections. Many schools buys services from that page (since it´s about protecting kids from drugs and alcohol; that is a big deal in Sweden). If you dig deeper you´ll find that scientologists are the ones running the site/service which means that most schools would not use their service if they knew that. Earlier you could just have a lesson or two to learn kids how to use critisism onto different sources, but nowadays you must use it every lesson you´re using internet. A page that tests your ability to distinguish real and fake pages (a phishing test). A checklist for questions to ask when evaluating a page on internet. SO-rummet – links to other pages about source criticism. Mediasmart – material for elementary and secondary schoool with focus on commercial stuff.